"Turki" redirects here. For other uses, see Turki (disambiguation). 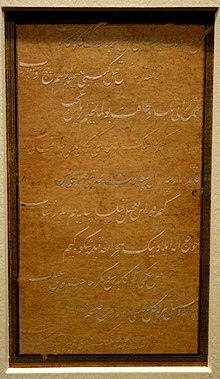 Chagatai (جغتای Jağatāy) is an extinct Turkic language which was once widely spoken in Central Asia, and remained the shared literary language there until the early 20th century. Chagatai is the common predecessor of Uzbek and Uyghur. Ali-Shir Nava'i was the greatest representative of Chagatai literature. 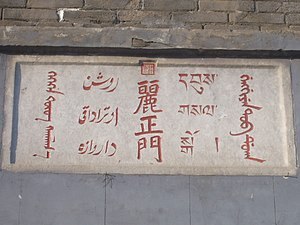 Lizheng gate in the Chengde Mountain Resort, the second column from left is Chagatai language written in Perso–Arabic Nastaʿlīq script. As part of the preparation for the 1924 establishment of the Soviet Republic of Uzbekistan, Chagatai was officially renamed "Old Uzbek", which Edward A. Allworth argued "badly distorted the literary history of the region" and was used to give authors such as Ali-Shir Nava'i an Uzbek identity. It was also referred to as "Turki" or "Sart". In China it is sometimes called "ancient Uyghur". The word Chagatai relates to the Chagatai Khanate (1225 –1680s), a descendant empire of the Mongol Empire left to Genghis Khan's second son, Chagatai Khan. Many of the Chagatai Turks and Tatars, who were the speakers of this language, claimed descent from Chagatai Khan. Late 15th century Chagatai Turkish text in Nastaliq script. The first period is a transitional phase characterized by the retention of archaic forms; the second phase starts with the publication of Ali-Shir Nava'i's first Divan and is the highpoint of Chagatai literature, followed by the third phase, which is characterized by two bifurcating developments. One is the preservation of the classical Chagatai language of Nava'i, the other trend is the increasing influence of the dialects of the local spoken languages. Uzbek and Uyghur are the two modern languages most closely related to Chagatai. Uzbeks regard Chagatai as the origin of their own language and claim Chagatai literature as their own. In 1921 in Uzbekistan, then a part of the Soviet Union, Chagatai was replaced by a literary language based on a local Uzbek dialect. The Berendei, a 12th-century nomadic Turkic people possibly related to the Cumans, seem also to have spoken Chagatai. Ethnologue records the use of the word "Chagatai" in Afghanistan to describe the "Tekke" dialect of Turkmen. Up to and including the eighteenth century, Chagatai was the main literary language in Turkmenistan as well as most of Central Asia. While it had some influence on Turkmen, the two languages belong to different branches of the Turkic language family. The most famous of the Chagatai poets is Ali-Shir Nava'i, who – among his other works – wrote Muhakamat al-Lughatayn, a detailed comparison of the Chagatai and Persian languages, in which he argued for the superiority of the former for literary purposes. His fame is attested by the fact that Chagatai is sometimes called "Nava'i's language". Among prose works, Timur's biography is written in Chagatai, as is the famous Baburnama (or Tuska Babure) of Babur, the Timurid founder of the Mughal Empire. Important works continued to be written in the Chagatai language into the early twentieth century. Among them are Musa Sayrami's Tārīkh-i amniyya (completed 1903) and its revised version Tārīkh-i ḥamīdi (completed 1908), representing the best sources on the Dungan Revolt (1862–77) in Xinjiang. Abel Pavet de Courteille, Dictionnaire turk-oriental (1870). Ármin Vámbéry 1832-1913, Ćagataische Sprachstudien, enthaltend grammatikalischen Umriss, Chrestomathie, und Wörterbuch der ćagataischen Sprache; (1867). Sheykh Suleyman Efendi, Čagataj-Osmanisches Wörterbuch: Verkürzte und mit deutscher Übersetzung versehene Ausgabe (1902). Sheykh Süleymān Efendi, Lughat-ï chaghatay ve turkī-yi 'othmānī. Mirza Muhammad Mehdi Khan Astarabadi, Mabaniul Lughat: Yani Sarf o Nahv e Lughat e Chughatai. Abel Pavet de Courteille, Mirâdj-nâmeh : récit de l'ascension de Mahomet au ciel, composé a.h. 840 (1436/1437), texte turk-oriental, publié pour la première fois d'après le manuscript ouïgour de la Bibliothèque nationale et traduit en français, avec une préf. analytique et historique, des notes, et des extraits du Makhzeni Mir Haïder. The Qing dynasty commissioned dictionaries on the major languages of China which included Chagatai Turki, such as the Pentaglot Dictionary. Chagatai literature is still studied in modern Turkey and regarded as part of the Turkic heritage. The Chagatai alphabet is based on the Perso-Arabic alphabet and known as Kona Yëziq (old script). ^ Hammarström, Harald; Forkel, Robert; Haspelmath, Martin, eds. (2017). "Chagatai". Glottolog 3.0. Jena, Germany: Max Planck Institute for the Science of Human History. ^ a b L.A. Grenoble (11 April 2006). Language Policy in the Soviet Union. Springer Science & Business Media. pp. 149–. ISBN 978-0-306-48083-6. ^ Robert McHenry, ed. (1993). "Navā'ī, (Mir) 'Alī Shīr". Encyclopædia Britannica. 8 (15th ed.). Chicago: Encyclopædia Britannica, Inc. p. 563. ^ Schiffman, Harold (2011). Language Policy and Language Conflict in Afghanistan and Its Neighbors: The Changing Politics of Language Choice. Brill Academic. pp. 178–179. ISBN 978-9004201453. ^ Scott Newton (20 November 2014). Law and the Making of the Soviet World: The Red Demiurge. Routledge. pp. 232–. ISBN 978-1-317-92978-9. ^ Andrew Dalby (1998). Dictionary of Languages: The Definitive Reference to More Than 400 Languages. Columbia University Press. pp. 665–. ISBN 978-0-231-11568-1. ^ a b Paul Bergne (29 June 2007). Birth of Tajikistan: National Identity and the Origins of the Republic. I.B.Tauris. pp. 24, 137. ISBN 978-0-85771-091-8. ^ Allworth, Edward A. (1990). The Modern Uzbeks: From the Fourteenth Century to the Present: A Cultural History. Hoover Institution Press. pp. 229–230. ISBN 978-0817987329. ^ Aramco World Magazine. Arabian American Oil Company. 1985. p. 27. ^ Pengyuan Liu; Qi Su (12 December 2013). Chinese Lexical Semantics: 14th Workshop, CLSW 2013, Zhengzhou, China, May 10-12, 2013. Revised Selected Papers. Springer. pp. 448–. ISBN 978-3-642-45185-0. ^ Vladimir Babak; Demian Vaisman; Aryeh Wasserman (23 November 2004). Political Organization in Central Asia and Azerbijan: Sources and Documents. Routledge. pp. 343–. ISBN 978-1-135-77681-7. ^ Kim, Ho-dong (2004). Holy war in China: the Muslim rebellion and state in Chinese Central Asia, 1864–1877. Stanford University Press. p. xvi. ISBN 0-8047-4884-5. ^ Bosworth 2001, pp. 299-300. ^ "Mabaniul Lughat: Yani Sarf o Nahv e Lughat e Chughatai - Mirza Muhammad Mehdi Khan Astarabadi (Farsi)" – via Internet Archive. ^ Haïder, Mir; Pavet de Courteille, Abel (1 January 1975). "Mirâdj-nâmeh : récit de l'ascension de Mahomet au ciel, composé a.h. 840 (1436/1437), texte turk-oriental, publié pour la première fois d'après le manuscript ouïgour de la Bibliothèque nationale et traduit en français, avec une préf. analytique et historique, des notes, et des extraits du Makhzeni Mir Haïder". Amsterdam : Philo Press – via Internet Archive. Erkinov, Aftandil. “Persian-Chaghatay Bilingualism in the Intellectual Circles of Central Asia during the 15th-18th Centuries (the case of poetical anthologies, bayāz)”. International Journal of Central Asian Studies. C.H.Woo (ed.). vol.12, 2008, pp. 57–82 . Cakan, Varis (2011) "Chagatai Turkish and Its Effects on Central Asian Culture", 大阪大学世界言語研究センター論集. 6 P.143-P.158, Osaka University Knowledge Archive.